Learn how the map point can be used and see it in action with the sample projects. What is the Map point? The Map Point can be used to display information on a live map view including the device’s current location or gps locations that are stored in another point, such as a GPS Point or an Ultradrop Point . The map point can also be used to populate a point by allowing the user to drop or move a map marker to the desired location. Can be used in conjunction with a GPS Point to display the GPS coordinates on a map. Can be used to set the coordinates of a GPS Point by dropping a pin on a desired location, on a map. Can be used in conjunction with an Ultradrop point to display multiple items on a map with the ability to select and deselect ultradrop items from within the map view. Supports adding a KML file to your map view to create graphical overlays on the map view. See the Session List Options documentation to learn how to add a KML overlay to your project. 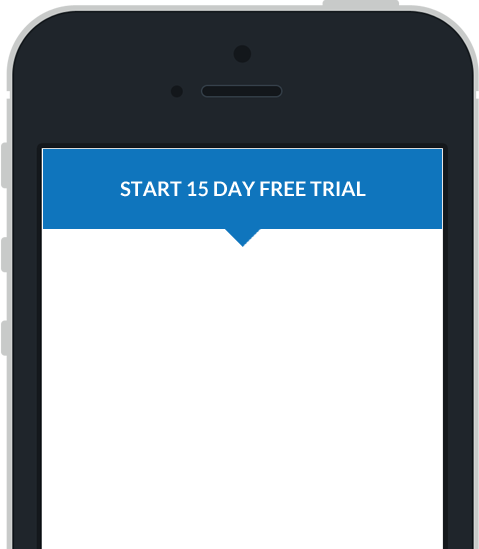 Haven’t installed the Mobile Data Anywhere Designer? You can get started by downloading the Mobile Data Anywhere Designer below or read through our Quick Start Guide to learn how to get started with Mobile Data Anywhere. The properties page for the map point provides an option to select the point to associate with the map point. The associated point’s value must contain valid gps coordinates in order to be displayed on the map point. The points that can be associated with a map point are currently GPS Point and Ultradrop Point . Below is an example of the properties window for a Map point, in the Mobile Data Anywhere Designer. The device’s location will be displayed but the map view will not follow where the device moves. The device’s location will be displayed and the map view will follow the device’s movements. Tracking device location and bearing. The device’s location and bearing will be displayed and the map will move and rotate with the device’s movements. The map will center on the user's last known location. You will need to ensure that both permissions are granted in order to allow the app to gain access to location services and to allow the app to track location changes in the background. You can check on the status of permissions from within the app by opening the Settings page and scrolling down to the Location & Privacy Settings section. Not Set Permission has not been requested yet. The app will request permission access when location services are required. No Access The user has denied access to location services. Location services cannot be used by the app until the user changes the location service permissions for the app. Limited The user has only granted permission to allow location services while the app is in use. The user has not granted permission for the app to use location services while the app is in the background. This will impact the performance of points such as the GPS Tracker point where location information needs to be tracked over time. Full Access The user has granted permission to access location services while the app is any state. This will allow all points to use location services as required. Open the Mobile Data Anywhere app. Scroll down to the Location & Privacy Settings section. Tap on the Location and Privacy Settings button. This will open the device's Settings app. Tap on Always to provide the best experience. The following samples demonstrate how the Map point can be used in conjunction with a GPS Point and an Ultradrop Point to provide advanced functionality to your projects. To get started, please start by downloading the project files that will be used in these samples. You can download the sample files for this tutorial or import the projects directly into your account. 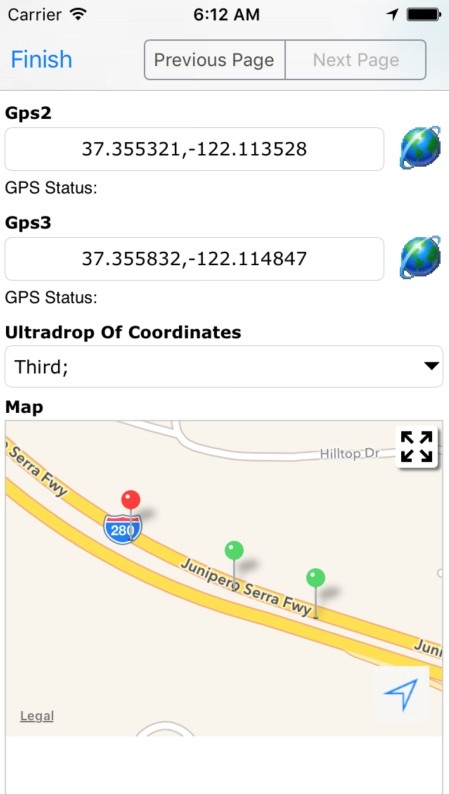 The first page of the sample project, map_point_demo.ppc , demonstrates how a map point can be used when it is associated with a GPS Point in order to display a location on a map. The map point, MapPointGPS, is associated with the gps point, GPSPoint. The GPS point has been configured to format coordinates with %lat%,%long% which is the required format in order to display the value on a map. On the mobile device, when a map point is displayed within a session the user will see a map view. The user can interact with this map while on the session form or they can click the expand button at the top right to show a larger map view. If the associated GPS point has a value, then the map view will display a map pin at those coordinates. If the GPS point does not have a value then the map will zoom on the user’s current location, if it is available. The user can set the GPS point’s value from the map view by tapping and holding on the desired location. The coordinates will be saved to the GPS point. The location can be adjusted by tapping and holding on the map pin and dragging it to a new location. This page demonstrates how a map point can be used when it is associated with an Ultradrop Point in order to display multiple locations on a map. The map point, MapPointUltradrop , has been configured to use the value of the Ultradrop Point , UltradropPointCities . The ultradrop contains data for three columns; City, Latitude and Longitude. The columns Latitude and Longitude are required in order to display coordinates on a map point. The appearance options have been configured to display the column City for each item which will also be used as the title for each marker on the map point. On the mobile device, the map point will display a marker for each item in the ultradrop’s data. When a marker is clicked, it will display the city for the associated ultradrop item. It will also display a button which allows the user to select/deselect the ultradrop item, from the map view. Selecting and deselecting markers on the map view will update the selected values of the associated Ultradrop Point . Selected markers are coloured red and deselected markers are coloured green. This page demonstrates how a Map point can be used to display multiple GPS coordinates. This uses a combination of GPS points with a Formatter point , Ultradrop Point and a Map point in order to display multiple, dynamic locations on a map. There are 3x GPS Points and each of these points have two associated Edit Points which use Dynamic References to extract GPS latitude and longitude from the GPS Points . Once the UltradropOfCoordinates is configured to use this Formatter point as a data source, this format string becomes the data for the Ultradrop point. This format string defines three rows or Ultradrop entries which are determined by each new line. The three columns of data for each Ultradrop entry is defined using tabs between values. The Ultradrop Point is configured with three columns; City, Latitude and Longitude. The columns Latitude and Longitude are required in order to display coordinates on a map point. The appearance options have been configured to display the column City for each item which will also be used as the title for each marker on the map point. This point does not have any data and will instead source the data from the 3x GPS Points via the Formatter Point . On the Advanced tab, the Ultradrop point is configured to share data from the Formatter Point called Formatter . The map point, Map , has been configured to use the value of the Ultradrop Point , UltradropOfCoordinates . This will plot each of the Ultradrop's entries onto the map as selectable pins. Selecting a pin will select the related entry in the associated Ultradrop point, storing the selected value in the session.